When I first met Lee Perkull 4 years ago, he was carting his 5’5”, 155lb carcass around in the bush on a 2006 Suzuki DRZ400 LEAD SLED. Now, I assure that he’s in good shape, and has the stamina to manhandle that beast for the day, but why bother, if you don’t have to! 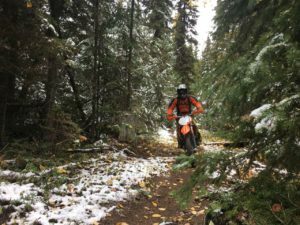 Vernon has a trail network better suited to a proper bush bike, and Lee decided 2 years ago that it was high time he gear up for what our Single Track has to offer. 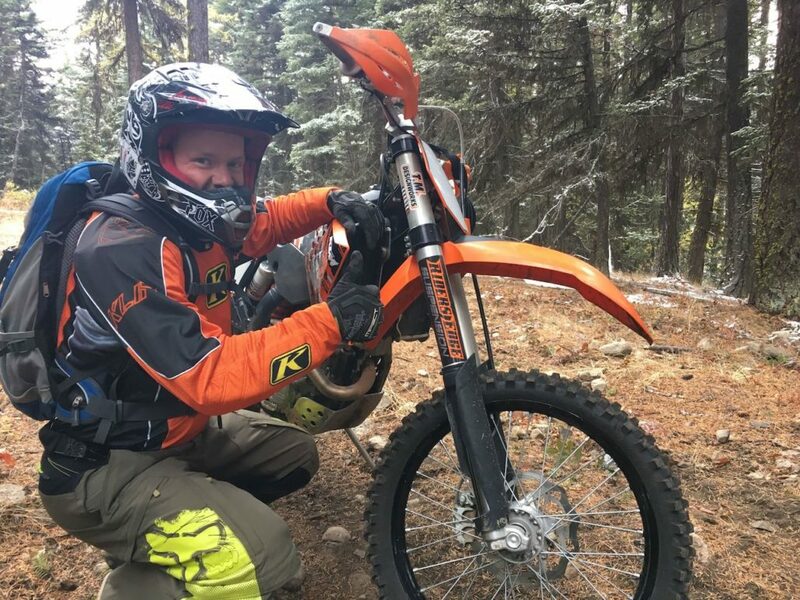 He started looking for a lighter, more nimble bike, and quickly became smitten with a mint 2009 KTM 250 XC-F.
Now he was armed with a bike that was better suited to the tight and twisty single track that we all know and love. Good to go, right? Well, almost. Lee saw that I run Riders Edge Suspension, front and rear on my hog, and started asking questions. • Did I actually notice a difference? • Would I recommend this aftermarket overhaul? • Does the benefit outweigh the cost? My answer to his questions was a resounding YES. My riding partner and I have had multiple suspensions overhauled by Ian McKill over the years, and have found the end result to be the most important aftermarket touch to our bikes. The 250 Goes Under the Knife! Lee rolled his baby thumper into Ian’s shop and let him work his magic. Time to gut the existing suspension, lower the bike an inch (did I mention that Lee wasn’t built to shoot hoops?? ), and build up the forks and rear shock with a bunch of Riders Edge secret weapons. Today was Lee’s first ride on his plush new suspension, and I was pretty excited to be there to ask some questions, and hear what he had to say about his latest acquisition. When you can see the smile through the helmet and goggles, you know the guy is happy. 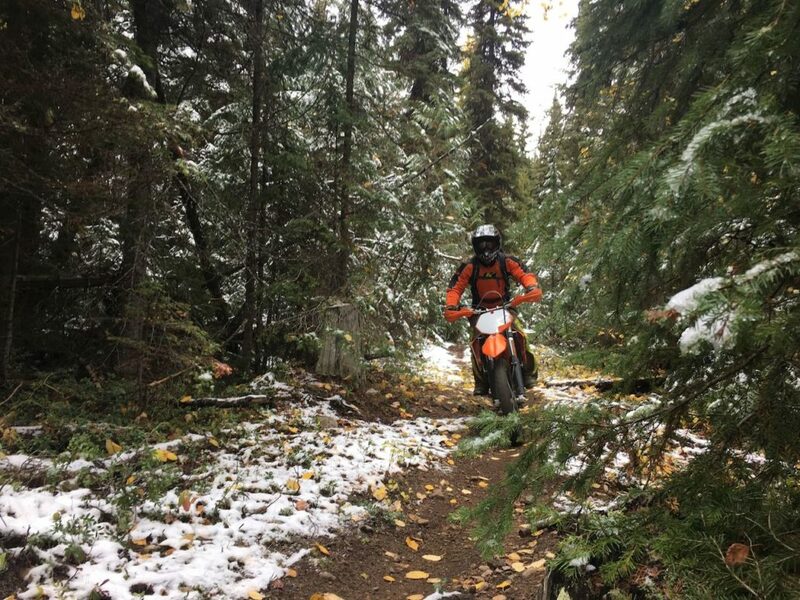 When he rolls up at each stop on the trail with nothing but positive comments about the changes to the bike, you know he’s wondering why he didn’t pull the trigger sooner! His bike now feels firmly planted. Any skittish behavior that was there before is gone. 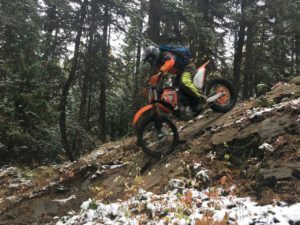 Lee is finding that the bike tracks straight through any rough stuff, and this has given him a stronger sense of stability and confidence. He can climb, corner and smash the ruts faster than before without the sense that the bike may go left, when he goes right. Very safe to say that Lee is a raving fan of Riders Edge Suspension . If you’re looking to tweak your ride, and don’t know where to start, suspension tuning is a sure winner. 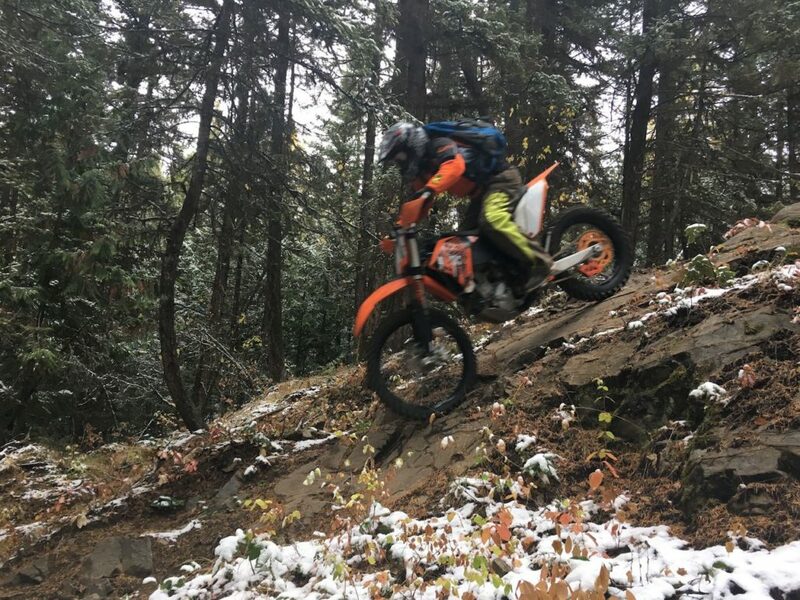 Whether you have it overhauled as discussed here, or set up what you have to your weight and riding style, a proper suspension tune will make for a more enjoyable ride, reduce fatigue, and boost your confidence.